The baseball DuraResin is a new design that features a twist on the traditional wreath. This wreath nestles a full color baseball attached to a gold and black ribbon that is draped over the top ends of the wreath. The black base has plenty of room to add a personalized plate for a simple, unique award for excellence on the baseball field. The basketball DuraResin is a new design that features a twist on the traditional wreath. This wreath nestles a full color basketball attached to a gold and black ribbon that is draped over the top ends of the wreath. 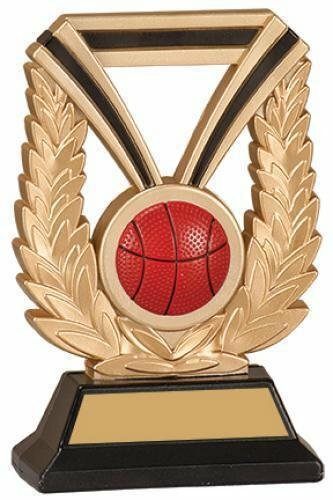 The black base has plenty of room to add a personalized plate for a simple, unique award for excellence on the basketball court. The Bowling DuraResin is a new design that features a twist on the traditional wreath. This wreath nestles a full color bowling ball attached to a gold and black ribbon that is draped over the top ends of the wreath. The black base has plenty of room to add a personalized plate for a simple, unique award for excellence in bowling. The football DuraResin is a new design that features a twist on the traditional wreath. This wreath nestles a full color football attached to a gold and black ribbon that is draped over the top ends of the wreath. The black base has plenty of room to add a personalized plate for a simple, unique award for excellence on the football field. The Hockey DuraResin is a new design that features a twist on the traditional wreath. This wreath nestles a full color hockey puck attached to a gold and black ribbon that is draped over the top ends of the wreath. The black base has plenty of room to add a personalized plate for a simple, unique award for excellence on the ice. The Volleyball DuraResin is a new design that features a twist on the traditional wreath. This wreath nestles a full color volleyball attached to a gold and black ribbon that is draped over the top ends of the wreath. The black base has plenty of room to add a personalized plate for a simple, unique award for excellence on the volleyball court.